Argentina may be thousands of miles away, but on December 5, you’ll be transported to this food lover’s dream destination with a three-course wine dinner at Bochinche. The restaurant has partnered with famed Catena Zapata, which is credited for its major role in resurrecting Malbec and discovering high altitude terroirs in the region. You’ll find out more from its brand ambassador, Andrea Nunez, who’ll be joining the unforgettable dinner. She has chosen to serve the winery’s biggest hits—the potent and full-bodied Catena Malbec 2014 and 2015, to the smooth and refreshing Chardonnay 2015—to be paired with a variety of dishes. You’ve got the crispy duck confit drizzled with quince honey to start, and progresses to the ribeye steak or the Westholme wagyu hanger steak (aged for 31 days). Let’s not forget about the dessert: a sumptuous pineapple tart tatin accented with smoked milk ice cream. Don’t you think the first week of the month deserves a toast? Thankfully, Jigger and Pony is celebrating Gin Jubilee by partnering with Roku Gin and creating the Hanakoto. The cocktail, which is available on December 6, is inspired by the sakura and chrysanthemum; it’s made by brewing the sweet sakura tea and mixing it with dried chrysanthemum, which has been sous vide with the Roku gin. Stay until 10pm for the flower arrangement masterclass led by Ikebana floral artist, Dan Takeda. Whenever you visit this restaurant, you know you’re always in for a substantial feast—especially with its updated lunch menu. The one to always go for is the All Star Ninja executive set lunch, which gives you a taste of its delicious eats. Sashimi is part of the menu, with options including kinmedai, chutoro and ama ebi. But the sushi selection is equally delectable too, especially its modern Japanese creations like the tai truffle konbu and the foie gras and scallop. Of course, these are all dependent on the seasons and availability of produce. If you find the latter too much, opt for the set lunches instead. The next edition of the wine dinner series returns on December 5, and it takes place at the Palais Renaissance outlet. This time, the spotlight is on wines from Cordero di Montezemolo, an expansive vineyard in the heart of the renowned Barolo region. The night’s host is winemaker Alberto Cordero, who’s flying all the way here from Italy to share his deep knowledge about his chosen pours. These include the bright and floral Langhe Arneis 2017; intense and slightly spicy Barolo Monfalletto 2014; and fresh and fruity Barbera D’Alba 2016. The chef has prepared a five-course Christmas inspired menu to go alongside your tipples. So while you’re sipping on some reds and whites, you’ll also savour the prawn cocktail studded with puffed rice, and chargrilled calamari and roast beef fillet, among others. Head chef Beau Churchill taps into his childhood to craft a tantalising four-course Middle eastern menu, with optional wine pairing. One of the highlights from the bites section is the Tomales Bay. It’s essentially Kelly oysters with a sprinkling of preserved lemon and topped with chilli oil pearls, inspired by memories of him and his friends eating oysters in the apple orchard. 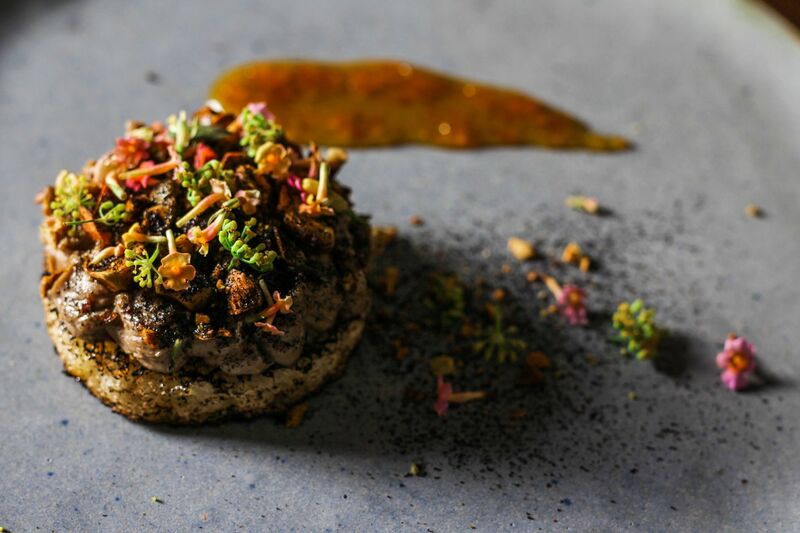 Heavier options include the Ash, made with grilled kurobuta pork collar coated with Turkish coffee, Szechuan pepper and zhoug (hot sauce), and the Down the Tracks, a 90-day aged striploin with tomato chutney and kashk (yoghurt).